The color of stained wood depends on the color of the stain itself, as well as the nature of the wood being stained, how long you keep the stain on the wood and how much you wipe off. Stain color cards and stain labels are good places to start; however, you may need to mix stains to create the look you want. Test an existing stain before customizing wood stain by following these steps. Consider the wood. Some types of wood are more porous than others and will soak up the stain better. 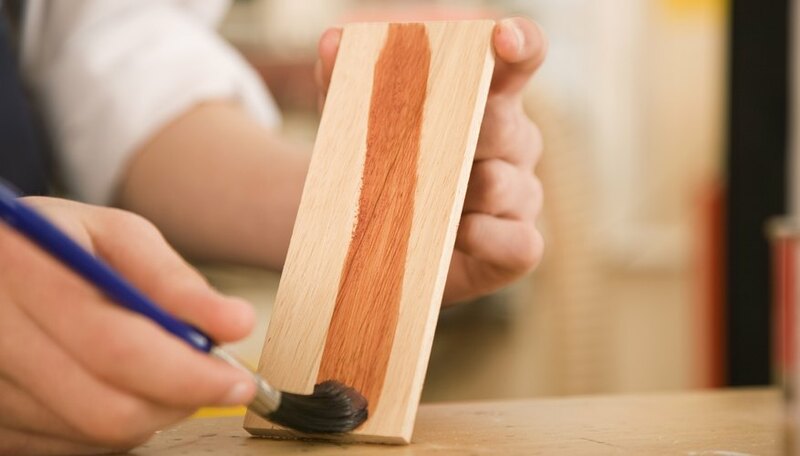 Always test a stain with a paintbrush on a piece or section of wood before committing to staining an entire item or customizing your wood stain. Notice the natural color of the wood and whether it has red tones versus gray ones, or whether it is a blond color versus a yellow color. Use a stain with similar hues as your base stain. The stain(s) you will add to the base stain should be of a different hue. Pour your base stain into a plastic container and slowly add a secondary stain, mixing with a paint stirrer or wooden spoon. Try not to mix more than three stains together--the result will be easier to duplicate if the mixture is less complicated. Test the newly mixed stain with a paintbrush. Repeat the previous step until you achieve the results you’re looking for. Attempt to mix enough stain to complete your project. This way, you won’t have to duplicate the mixture. Mix only stains of the same brand. Do not mix oil-based stains with water-based stains.